To apply for the badge, you need to submit a project via the badge application form that describes how you approached the challenges in this course. You do not need to have completed all challenges to apply for a badge. Step 1: Go the Mental Wealth Activist badge page. Step 2: Click on blue 'Submit a project for this Badge' button on the bottom left of the screen. Step 3: When prompted - 'we're going to connect you with P2PU badges. Ok with you? ', click yes. You should now see the badge application form, shown below. 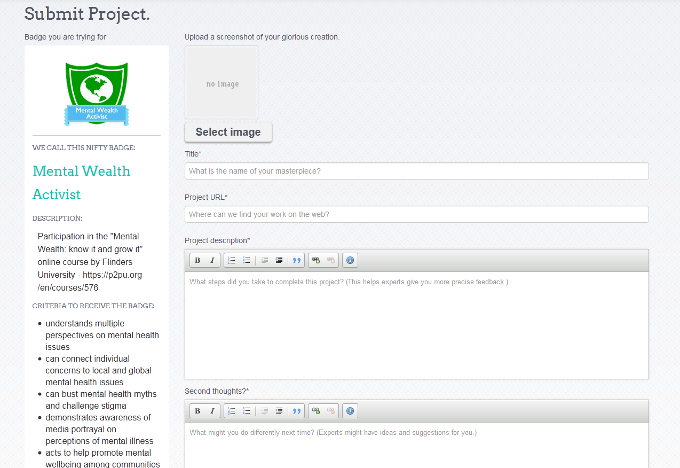 Step 5: Once you have filled in the form, click 'Create a project'. You will see a message to say that your submission has been completed and a confirmation email. (check your spam box in your email if you don't see the email, the sender is 'Badges'). Feedback about your project is given by any participant who has already earned a badge. Please allow a few days to receive some feedback. You will receive an email to let you know when you have feedback and when your badge has been awarded. These badges are intended to be peer-awarded. Anyone who has earned a badge, can provide feedback and award a badge, so your feedback may come from a peer in your course. In your email about your badge, there will be links to other projects that are waiting on feedback. You can also go to http://badges.p2pu.org/ at any time, and use the 'Review a project' option in the top menu, to give feedback and award badges to others who have submitted their projects. We encourage you to try reviewing a few projects. There is no right and wrong with this, and if you feel the applicant needs to provide more information, you can do this as part of the feedback. If you are waiting on feedback (please allow a few days), feel free to post into the forum on this page, asking for someone to review your badge application.